Today Morning, 13 March 2018, explosion of an explosive devise struck the convoy of Palestinian Prime Minister Rami Hamadallah, who was accompanied with Major General Majed Faraj, Chief of the Palestinian General Intelligence Service (GIS), shortly after the convoy entered the Gaza Strip. 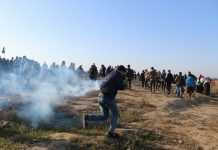 The Palestinian Center for Human Rights (PCHR) condemns this explosion in the strongest terms and calls upon the Attorney General in the Gaza Strip to investigate the incident, declare the results in public and immediately take action to curb the state of security chaos and proliferation of weapons in the Gaza Strip. PCHR also emphasizes that this incident would be a motive for both parties to end the division immediately. According to PCHR’s follow-up, at approximately 09:50 today, the Prime Minister’s convoy accompanied with Chief of GIS, Majed Faraj, entered the Gaza Strip via Beit Hanoun “Erez” Crossing in the northern Gaza Strip to inaugurate a sewage plant in the northern Gaza Strip. At approximately 10:00 when the convoy was next to Mesleh Stone Factory near al-Shawa Petrol Station on Salah al-Deen Street in Beit Hanoun, an explosive device planted under a lamppost on the street exploded. As a result, two vehicles in the convoy sustained severe damage; one of which is a black Dodge, and completely stopped. Moreover, 5 other vehicles in the convoy sustained minor damage. However, the convoy went on, except for the two damaged vehicles, and the Prime Minister headed to inaugurate the plant. At approximately 11:20, the Prime Minister left after taking Al-Nada Housing Project Street, northwest of Beit Hanoun. PCHR reiterates its condemnation of targeting the Prime Minister’s Convoy and emphasizes that the state of security chaos and proliferation of weapons shall be curbed in the Gaza Strip as it threatens the life of civilians. PCHR also called for opening a serious investigation into the incident and declare the results in public. PCHR underscores that both parties to reconciliation shall take into consideration the current delicate stage and not give way to sabotages to bury alive the efforts exerted to end the division. PCHR also emphasizes that this incident shall drive the two parties to accomplish the Palestinian reconciliation, work for the Palestinian people unity, face the challenges endangering the Palestinian cause and unify the efforts to end the Israeli occupation.